De start van de eerst nieuw gebouwd Audi Q3 is een feit. In Györ is e eerst Q3 van d band gerold in de kleur Turbo blauw. 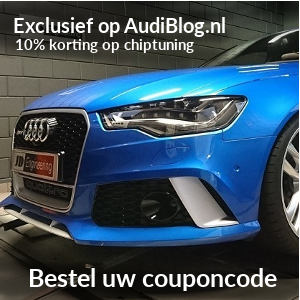 De Q3 is leverbaar met 3 TFSI en 2 TDI motoren. The first Audi Q3 of the second model generation drove off the assembly line at Audi Hungaria today: The color of the first premium compact SUV from Győr is Turbo Blue. Audi offers the new Q3 with four different engines: three gasoline engines and one diesel in combination with front-wheel or quattro drive. “Meanwhile, nearly a third of all the Audi’s we deliver are SUVs. The production of a Q model is a clear commitment to our site in Hungary; it strengthens our competitiveness and thus secures the long-term success of Audi Hungaria,” stated Achim Heinfling, Managing Director of AUDI HUNGARIA Zrt. “I am proud of our employees, who have managed the start of production of the Audi Q3 with many years of expertise and great passion for the model,” added Heinfling. For the production of the second generation of the new, sporty Audi Q3, a new body shop of 80,000 square meters was built and 700 robots were newly installed. The production hall was built in a record time of one and a half years. More than 1,000 employees have been trained for production of the Audi Q3 in the past one and a half years. New, innovative robot cells were installed at Audi Hungaria’s training center especially for this purpose. The Audi Q3 is the fifth model from Győr. The SUV shares a production line with the Audi A3 Sedan and Cabriolet as well as the Audi TT Coupe and Roadster. The plant in Győr therefore has one of the most flexible assembly lines in the Audi Group. Audi Hungaria has an annual production capacity of 160,000 units, making it one of Hungary’s largest car manufacturers. The company currently employs a total of more than 12,500 people, approximately 4,500 of whom work in automobile production.